While most Vietnamese people dream of owning a place to live in a big city, only five percent of the people who live in Hanoi can afford to buy a home. Dean Cira, the World Bank urban sector coordinator, said that due to the high costs most people had no opportunity to own their own in Vietnam. In the report “Urbanisation Review in Vietnam” issued last week, the World Bank revealed that real estate prices in Hanoi and Ho Chi Minh City were high when compared to other cities in Asia. “The price of vacant land is roughly USD500 per square metre and more in both cities and the price for vacant land in the city centres is much higher,” the report said. And, when compared Hanoi and HCM City, prices in Hanoi are twice those in HCM City. Cira added that when the figure was USD7,000 to USD8,000 per square metre of vacant land in Hanoi, it was USD4,000 per square metre in HCM City. “This unusually large difference suggests that vacant land prices reflect a strong expectation of increased rent or resale value in the future which would justify such a high initial investment,” he added. Cira said the price of land in Hanoi and HCM City was equivalent to income earned though renting a property for 80 years. “The price of land is nearly 1,000 times the monthly rent at the same location,” he added. Dang Hung Vo, former Deputy Minister of Natural Resources and Environment, said the current average price of a home was 25 times a worker’s annual income and that was five times higher than in developed countries and 10 times higher than in developing countries. “If a worker saves 30 percent of his income, he will be able to buy a house after 75 years. 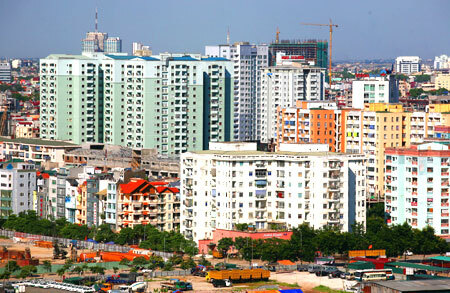 The price of real estate in Vietnam is the highest in the world, while the average income of Vietnamese workers is among the lowest,” Vo said. Meanwhile, CBRE Vietnam said that a Vietnamese person with an average income had to save for more than 50 years to be financially capable of buying an average apartment. The recent issue of “Market Research” looked at how many years a family in Hanoi and HCM City would have to save to buy an apartment were jointly conducted by CBRE and market research firms TNS and Nielson. The research assumption was that a family would be able to save 19 percent of its income that would later be used for a home purchase. The study findings show that families with an average income, earning around VND160 million (USD7,680) a year or VND13 million (USD619) a month, have to save for 30 years to be able to purchase an inexpensive apartment for VND880 million (USD42,000). It would take a person 51 years to save enough money to buy a VND1.5 billion (USD71,400) apartment and 96 years to buy a better quality apartment costing VND2.8 billion (USD133,000).